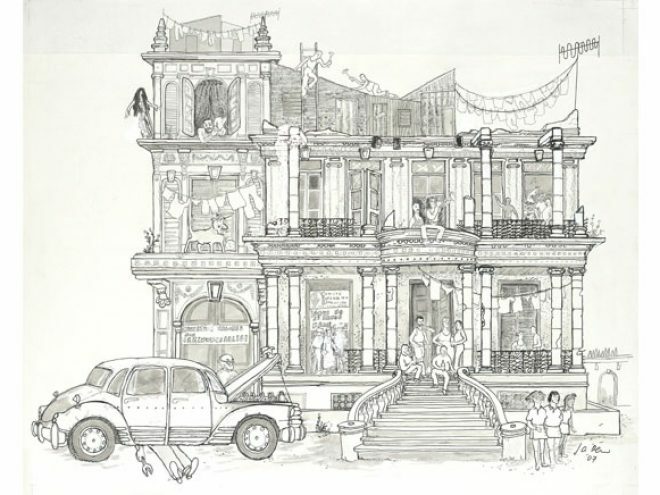 The drawing shows the house on what the heroine calls “happy hammer corner.” Like everywhere in Havana, somebody is always banging and tapping, dividing floors and putting shacks on the roof, “inventing” yet more living space. You can see the young heroine with her school-friends Linda and Yadelis (bottom right), and later with her abusive lover Moisés in the window (top left) from which he falls, thanks to the mysterious Alix (swinging from the parapet), to an entirely timely death. Other characters shown include the would-be trumpeter Poliester (nobody can pronounce Dniester, his real name), parish priest and confessor Padre Ignacio, the drunks permanently in the hallway and “el Megaterio,” the fierce dog who terrorises the building. January 2015 This article formed part of the January 2015 issue of What’s On Havana The definitive monthly travel & culture guide to Havana Download our current issue of What’s On Havana, your definitive travel, culture and entertainment guide for all things happening in Havana, Cuba’s bustling and enigmatic capital city. We include features from around Cuba written by the best international travel writers covering Cuba. Our monthly online digital magazine is also available in Spanish and French.